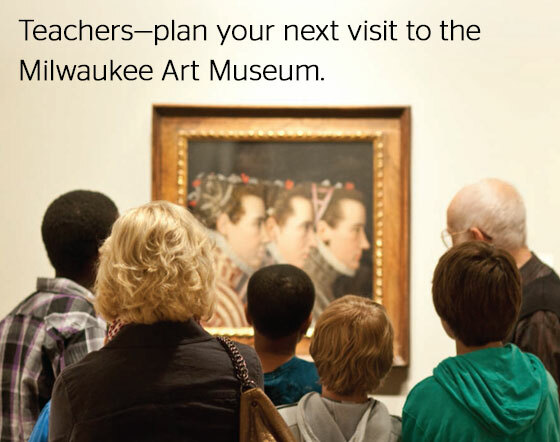 Milwaukee Art Museum tours and programs promote critical thinking and interdisciplinary curriculum applications. Find them all on mam.org/learn/. One day only—the On Wisconsin! program is back! Students will see Wisconsin history come to life during an interactive performance by storyteller/performer Bob Kann and in works of art from the Museum’s Collection. This program is directly connected to state history studies and includes everything from artifacts and folk art to Wisconsin legends such as Harry Houdini, and weird-but-true inventions (ice cream sundaes, anyone?). Register online or call 414-224-3842. Treat yourself to a free evening at the Museum just for teachers. Take a behind-the-scenes tour of the new Kohl’s Education Center, get tips from Museum educators, and network with colleagues at a welcome reception. Registration is required: Email teachers@mam.org with your name, school, grade, subject, and phone number. Thanks to the Terri and Verne Holoubek Family Foundation, individual Wisconsin K–12 teachers who present a valid school ID or pay stub will receive free admission to the Museum. Teacher Passes are distributed to the schools directly, at teacher events and conferences, and are also available on-site at the admissions desks. Spread the word to the K–12 educators around you! Thanks to the Terri and Verne Holoubek Family Foundation, each student that participates in a school group tour during the academic year will receive one Museum Family Pass. Each Family Pass provides free admission to the Museum for two adults and up to four children younger than 18 years old. In addition, individual Wisconsin K–12 teachers who present a valid school ID or pay stub will receive free admission to the Museum. Become a Member and enjoy year-round benefits, including free Museum admission and exclusive discounts (classes, parking passes, Museum Store, Café Calatrava).